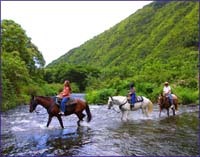 Take an unforgettable journey onto a 12,000 acre working cattle and sheep ranch where the breathtaking beauty of North Kohala will unfold before your eyes. 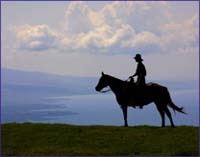 We offer open range riding (not head to tail) and cater to individual riding abilities. Experienced riders can enjoy cantering if desired. Join us on a journey through a lush tropical paradise of jungle trails, freshwater streams, taro fields, magnificent waterfalls and incredible vistas. Only in Waipi'o Valley is there such a variety of historical and spiritual places to discover and appreciate. When using our on-line booking system use coupon code "10 Off" for your discount.